When most people think of homeless shelters, they probably don't think about gardens and greenhouses. Though it might not seem like they go together, food is an essential part of the services we provide. At Central Iowa Shelter & Services we know that having access to fresh healthy food options isn't something our clients are focused on, so we are making it our priority to benefit them. Mulberry Farms & Food is a growing program run by Central Iowa Shelter & Services staff and clients aimed at providing healthy and locally grown food options to use in the Mulberry Street Cafe, the kitchen program at CISS. First started in 2014 with the help of DuPont Pioneer, the farm was built in the CISS backyard with a 30-foot growing dome and 10 raised growing beds. In the first full summer of the program we grew around 100 pounds of produce, all of which was used to feed people out of our kitchen. After some trial and error, 40-plus koi fish were added into a tank in the dome as a part of an aquaponics system used to help speed up the growing process and regulate the temperature in the dome for year round growing. In the winter of 2018 CISS was given a set of greenhouses in Altoona the Master Gardeners of Iowa had one time called home. Mulberry Farms & Food staff are working to get the space cleaned up and ready to use for the upcoming growing season. With expanded space for growing and an ever growing list of supporters we are hoping to be able to produce enough food on a yearly basis to begin selling to local businesses and organizations to increase he amount of local food that gets consumed in Des Moines. 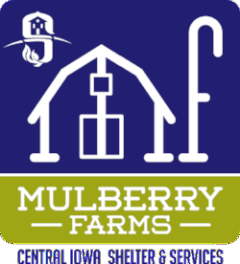 Mulberry Farms & Food is special because all of the work done for the whole program is done by clients. These clients apply and interview like any other job, and if hired they spend their time working with our on-staff Master Gardener to help plan, care for, and manage all of the outdoor aspects of our facility. The trainees make just above minimum wage, but must be clients staying at the shelter. With some smart saving, the money they earn can add up quickly to help pay for things they need to get back out on their own like an apartment. Trainees in this 8-week program learn all of the basics of greenhouse growing, planting seasons, and general upkeep of the grounds of a large facility. Beyond those gardening skills they are learning the essential job skills they need to keep any job they would be hired for outside of CISS. Things like showing up on time and working with a supervisor and other co-workers. Through the job-training program they get 1-on-1 assistance from staff members to help them build their resume and increase their chances of being hired. Mulberry Farms & Food is committed to putting people back to work!